Our online of the M.A. in Training and certificates has grown tremendously over the past five years. Now nearly 80% of our enrollment is fully online. With so many students choosing this option, to improve our practices in online teaching continuously. Our faculty has created an ongoing list of practices that they use to improve online learning. Students in TRDV 501 Online Teaching Theory & Application will be adding to this list. Please review the “best practices” listed below and add a comment to this post with an additional “best practice in online teaching” of your own. Ask Strong Questions: In the forums/discussion boards focus on asking strong questions that test a student’s understanding of the topic. I presented a “seek circle questions” tool in April to RU that I will share with this team as well if you would like (Ken). Stay current in the forums–don’t just check them, but participate as much as your schedule allows, so students feel connected (Kathy). Keeping in Constant Touch: Checking discussion forums each day and participating in their discussions helps to keep up with what they’re experiencing and helps me guide them through any difficulties they have. (Meena). Change dates in the syllabus, grade book, and anywhere else that they appear (Kathy). Check links before each module to make sure they still work. If they don’t work, locate a replacement when possible and change it on the page. If you need help with this, don’t hesitate to ask (Kathy). Make written instructions for all assignments as specific as possible, i.e. what should be included, how, when, etc. This will prevent misunderstandings and different expectations (Meena). Late Assignment Policy: Assignments submitted after the due date will be accepted up to ten days after the due date, but will lose 2% points for each day late. No assignments will be accepted if they are more than ten days late unless there are extenuating circumstances. Free Pass: You have one free pass that allows you to post an assignment of your choice other than the final research paper-up to ten days later than the due date with no loss of points. To use your free pass, notify me by e-mail. Give students detailed feedback about their work–I’ve found that positive feedback needs to be just as detailed as feedback focused on improvement or students will not know what they’ve done right (Kathy). Respond to student emails within 48 hours most of the time. If you’re going to respond later than that, let students know (Kathy). I answer emails each day and am now taking my laptop everywhere when I travel so I can log on each day. Responding quickly to emails/postings reassures students we are there to help them (Meena). My best practice is calling students on the phone if they are really struggling. I know we have audio learners that need to talk it out or hear a voice. They always appreciate the extra help, and it is easier than back and forth when email isn’t working for them. Plus, it makes a connection, they realize there is a real person on the other end (Loren). Set up a “Case Study” or “New Tools” Toolkit in your class. I have a work in progress RU Class Toolkit for students to provide tools and resources so students can advance their new skills and broaden their understanding of theory in real-world situations (Ken). Can you think of an additional best practice in online teaching that is not mentioned in the above list? A few of these go together well. Case studies make the assignment more exciting. When participants have the ability to apply what they are learning to real-world scenarios they get an ROI on the spot! It does take some work to design something flexible for students from all types of backgrounds, experience levels, and occupations. My current class has this built in and it was tough to build a case study that applied to my real life work. It is a bit too meta at points, but the assignment guidelines helped bring me back. I have had this case study opportunity a few times in our TRDV program and it has been super helpful. This article was great and very informative. I must admit that the online program is perfect for adult students. Especially ones with busy lifestyles. If it were not for this program I would not have been able to complete this degree. I found the professors to be extremely helpful and understanding. The university if friendly and supportive of it’s students. I highly recommend the school as well as the program. Hello-great discussion here. I am not a part of TRDV 501, however I am only two classes away from graduating, and therefore, I decided to weigh in on the discussion. I must say there are four best practices that have meant the most to me as an online student: 1. the professors/instructors who also engage and share in the discussion forums, 2. the professors/instructors who consistently let us know they are available for any questions/concerns, 3. the professors/instructors who give students until Thursday to process the learning material and submit their initial post (also, I love the four, two-week modules! ), 4. the professors/instructors that require/encourage students to engage in meaningful discussion of two peers, as opposed to 4 or more (often times, if the requirement is to engage with 4 or more peers, the participation becomes focused on the number, as opposed to the quality of content and level of meaning). In an attempt to encourage the development process of each student no matter their GPA and or success in the course, engage with each person-challenge them to consider what their life would be like 5 years from now or 10 years from now if they continually progressed or achieved the goals they set out to achieve. It can be easy to get caught up in the here and the now. However, the here and the now is over before we know it. Do students have hopes, dreams, desires that will take place during session or after graduation? If yes, is there a platform for them to express this, gain insight from others, and be encouraged to move forward? Great points Janell! It’s helpful to get a student’s perspective on this. I appreciate your taking the time to post your thoughts and will take this into consideration in our course design. 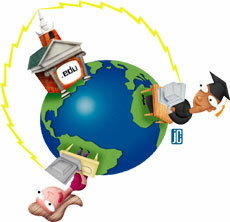 Online teaching and online learning is really beneficial for teachers and students respectively. I would definitely love to suggest that every job seeker, student employer should use a best online training platform to gain more knowledge and to be more productive. I think using video in online learning allows us to bring learning closer to the learner. It also enables us to offer better demos, manipulate pictures to enrich learning, and maintain consistent standards in information delivery. I also like the idea of a class conference call. One of my instructors organized a couple of calls during the semester. We were able to talk to each other in live break out groups, ask questions and get answers in real time. Everyone who participated enjoyed this opportunity to further get to know one another and not have to wait for a response in the forums. I like conference calls and webinars. I have never done one but have participated in many. It allows the instructor to get and receive immediate feedback. I’ve read some really great Best Practices here. Those that stick out in particular are those that involve the professor participating daily. One course I am taking now (TRDV 501) has been the greatest example of the difference professor participation makes even with it being so early in the semester. The value of comments and compliments to guide students continuously makes the non traditional environment of an online course feel all the more comfortable. Another best practice for professors would be to have flexibility. Some professors seem uncomfortable and almost angry when students reach out to them for more information than what was presented in the handouts, syllabus, and lectures. Its important to use more resources than just the text and to be able to apply real life reasoning in certain situations as well. Agree–and the FAQ forum is particularly useful so that questions are visible for everyone to see–we all benefit from the feedback. It’s created a really good option for not bogging down the discussion groups with more global questions. Oh yes! The FAQ/Virtual Water cooler forums definitely help generate and solve questions for everyone. It most likely reduce email and call traffic for the professor as well. In online classes, using videos or audios as a way to present the lesson is great to have as an option because it does bring a personal touch to the online classroom. In the video or audiocast, it is very helpful to discuss each assignment due for the module and where to find the information to do the assignment. I think that appeals to the audio and visual learners. I really like the idea of using videos and audios for those who have different learning styles. I am in the process of finding free online resources for my f2f courses. .orgSource President Sherry Budziak has been chosen to be a presenter at the Association Forum of Chicagoland’s Holiday Showcase in December. With the staggering growth in mobile devices and data traffic, associations should be looking to gamification to engage with their members. Mobile gamification allows organizations to collect powerful data, gather valuable feedback, and provide continuing education in news ways that give members a rewarding sense of achievement. Gamification also helps remind members that their association is present and interested in what they have to contribute. In this session, Ball and Budziak will share how gamification has allowed the ACCP to better meet the needs of its members, invigorate the conference-goers who attend its annual CHEST meeting and reach out to the general public as well. Association Forum’s Holiday Showcase is widely considered the industry’s best and most highly attended one-day exhibition for Chicago’s multi-billion dollar association market. The 2013 Holiday Showcase is scheduled to take place on Tuesday, Dec. 17, at the Hyatt Regency Chicago. Those “Best Practices” listed above are great tips/guidelines for students. I too, find the short Screenr videos helpful, as it brings the human connection to the course. I do understand that most information presented in online courses come with plenty reading (assignments, lectures, explanations, schedules etc.) But I think in order to appeal to different learning styles, it could be helpful to use more visuals, audio at the start of new modules, to assist those students who get overwhelmed with the readings. I am big fan of Johnson and Aragon’s seven principles in online teaching, and “avoiding information overload” is key for me with my introductory students. Blackboard’s adaptive release and time release a great features. They hide content until a date or action triggers them. This makes the blackboard site more streamlined, navigable and less daunting. Agreed! Information( documents, folders, modules) overload can make navigating a learning platform extremely daunting, immensely frustrating students. Time release is great! I like all these ideas! *i like grouping students for discussions when the class is large. *To add to # 14 Not only does incorporating a variety of activities make the class more exciting, it helps to engage students who learn differently. *It would also be a good idea to include a policy for special needs students. Great point with special needs students. I have to say that I have not thought about how to address their needs in the online environment until now. I think we should add a statement about the needs of our students on our syllabi. I do this for my face-to-face courses. We need to refer them to groups within our organization or college who can help them. We may need to allow extra time on assignments on a case by case basis but, I wonder what that would change for deadlines we set on our forums for everyone. Yes, groups for discussion, in my experience just bring a bit more organization to posting and replying. I kinda like assigned groups myself in online environments, but that is personal preference. It give me a little bit of structure, one less thing to worry about trying to add myself to a group. I took three online classes last summer and there was one notable difference between them that I thought I could mention here. All three classes came with a printable, clear calendar of events that displayed all the deadlines. The description of assignments in two of the classes referred student to the calendar. The third class was different. The deadline for each activity was separately stated in the links to the activity – and that was always visible in the breadcrumbs on the top of the page. This was such a small difference but in practice ended up as a great convenience. I imagine there are risks with duplication of deadlines and it takes a few extra hours of work prior the start of a semester but I think it is worth the effort. Thanks for your suggestion Marta–we often forget that details like dates can be so important. I also wanted to comment that #5 above (regarding the gradebook) is so important. Students are obsessed with checking the gradebook, and can get extremely frustrated if the calculation is off, or there is a funky glitch that makes it look like they have a D when the have a B because something was weighted incorrectly, or whatever. Make sure that gradebook is super clean before displaying it. I completely agree. There is a subtle message there when the grade book is messy. I think that it is important for students to perceive the instructor as someone with high expectations and also someone who works very hard on the same course. Agreed! Although I do not teach online, that is probably one feature I do not use course copy on. I always create assignments fresh at the start of the semester. 1. If possible, add office hours–either face-to-face or through a virtual office (Google Hangout, etc.). I think this helps personalize the virtual world a bit. 2. Be careful with creating group projects/group work. Make sure that you allow space for a variety of people and expectations. Allow groups to evaluate each other so that they have room to communicate issues, problems, and concerns without it interrupting the flow of the work. For instance, if a student joins an assignment late–allow students to report that on an evaluation instead of having to argue about it in the middle of doing an assignment. 3. I guess related to number two, don’t be shy about intervening in discussions that are, for whatever reason, getting out of hand or off-topic. I agree with intervention sometimes being required. I’ve been part of discussions at RU courses where individuals have a very focused need to address their particular issues, to the detriment of the group outcome. There could be a gentle realignment by the instructor that would be difficult for the group members to address. If the instructor knows they will be out for an extended time (vacation or other long absence) build it into the syllabus to set student expectations at the beginning of the class. Also include who will be facilitating the class while the instructor is out. It seems like such a small minor thing, but when a student gets used to an instructor only to have another one mid stream is jarring and disrupts the energy and flow of the class. Yup. This happened to me recently. The professor left the country for a week in the middle of the class. It really jarred some students. In one of the articles I was researching for “Creating Community in Online Learning Environments,” as well as in prior courses, small group activities can be very useful, particularly for groups where the roles change from week to week. The downside to creating these groups is that the groups tend to become somewhat isolated from the rest of the course–I know my own group members fairly well, but may not interact as frequently with other groups’ members. Yes, I think that is true about feeling isolated, but I have to admit, in such a super short class with a fairly big enrollment, I probably wasn’t going to get to know everyone that well any way. At least with a couple of group assignments, I can connect with a few folks. Agree–as you indicate, this is one of the larger online courses that I’ve been part of, and also the time frame is a constraint. I really enjoy the video messages – even just an introduction is great. It brings a different level of personalization so the instructor isn’t just a picture. I really like clear documents that outline expectations each week, which we have in this class. It really helps to stay organized for those of us who like check lists. 🙂 I think this list is pretty comprehensive! I printed it for future reference! I agree–we are accumulating some fantastic ideas here. Thanks for sharing your thoughts about videos and documents. Video messages are great for both online and F2F classes. These provide clear description of the requirements of the course. I am one of those people who likes checklists and manuals or handouts! And I agree, this helps a lot. this is an approach I will try to use maybe 3 times during a semester I was teaching. I can think of one thing to add. I think this is particularly helpful at the beginning of the course, when some students may still have trouble navigating the class. If it appears that a student will miss a deadline, send a warning e-mail BEFORE there are consequences. In cases like this, a one-line warning might be more useful for students than detailed feedback after the fact. I agree, Marta. I think this is a huge benefit for the first few weeks until everyone starts to understand the pace and structure of the course. Absolutely. I unless I get a “head start” in some of the readings/ forums and it definitely takes me a week or two to get the hang of things with online courses. It would be mighty helpful. Maybe they can utilize something like a GradesFirst system, but without the connection to college advisors? This best practice is very similar to others, but an example of each assignment is very useful. It helps clarify anything that was unclear in the assignment. Yes, that is useful along with any templates! One Best practice I learned in both Ms. Prima-Anderson and Ms. Washburn courses are Robert Gagne’s nine events of instructions. The above are a sequence of steps to guide the trainer or instructional designer. These step can help keep the learners engage and motivated to want to see what is next. I liked Gange’s framework as well. It is nice package to put the context of the course in. I also think this is a great framework. We refer to it my my team at work as well. No doubt Robert Gagne’s nine events of instructions can make learning and teaching dynamic experience. I learnt about these during TRDV courses too and found very helpful in designing a course. I agree with Andrea, the instructors must keep in constant contact with their students in a timely manner because it is crucial that students get full understanding of the lesson or assignments due being that their is no instant gratification of answers required at the moment of misunderstanding. Also Skype or programs similar would be great to attach to the online course for that instant gratification as long as their are appropriate times for the connection. In addition, Aren’t instructors required to take courses that would keep them up to date on ALL new technologies to provide versatility for their students? I forgot to mention another concern. I am a student that enjoys and prospers better in a course done in a classroom. The discipline portion of mandatory classroom attendance to receive the knowledge seems crucial to my success of completing my education. What is the suggestion of best practice for people who do not work well with online course and prefer on in class courses? I had a mandatory online course and it was the most stressful semester in my educational career as a student. Sorry to hear about your online challenge! You are such a great communicator, I would suggest staying in contact with your instructor, posting to forums, and also printing out all material and making a binder can be helpful to new online learners. It would be very interesting to find out the reasons for such preference. I am currently teaching a traditional, face-to-face but web enhanced course and a student declared that she won’t be using Blackboard because “she is bad with computers.” I am certain there are all kinds of reasons, including very good ones. I am an entrenched face-to-face instructor and I hope that in-class teaching will always have a place in our education. I always thought I would prefer classroom to online, but as I’ve worked through these online courses, I’ve seen great improvement in engagement and the tools available. I also have found that it is my job to discipline myself to participate, and have found online courses to be surprisingly MORE engaging because of this. Think about it–with a f2f course, you may only interact with your classmates one a week, whereas in this course (partially dictated by the short timeframe), we are working together at least 4 or 5 times per week. One best practice: Make an agreement with yourself how many times you’ll get on the platform per week–3, 4, 5, etc. That way, you will feel refreshed after a day off to satisfy your other obligations. Yes, in an ideal world all instructors would be up to date all the time but things change so quickly! We have a course in or curriculum TRDV 502 that addresses new technology in online learning so this is a step in the right direction! Excellent point about timeliness Andrea and Antoinette. I agree, staying on top of questions and grading is so important. I have created a daily schedule for myself to help me keep up and remain focused–particularly in accelerated classes like ours where timing is critical. In one of the previous classes I attended we discussed the ways to stay organized and motivated – not as a learner but as a teacher. Some professors have their “rhythm” of posting the new modules, giving feedback on certain days of the week, writing the mid-week announcements. I think it is definitely worth a thought, when you are becoming an online instructor, to figure out how to blend the teaching job with your daily activities and SCHEDULE it in the same way you would schedule your onsite class preparation. Paulina, I agree as an instructor (period), it is important to be organized. In my previous class with Ms. Prima-Anderson as the instructor, she advised her students to set aside at least five hours for studying. When I first read this information in the syllabus, I said to myself I don’t need five hours to study, but I quickly learned she was correct. The instructor must know what they are doing , and when they need to do it, and why they are doing it. I agree and this practice has helped me a great deal–when I follow a schedule I avoid getting behind or overloaded which can happen to teachers just as it does to students in online classes. One of the biggest best practices would be “stay overly organized” the syllabus and the assignments documents must be clear. The due dates should be organized correctly and the assignments should be explained very clear. The student does not have the ability to raise their hand and ask a question and often has to wait for Instructor responses to email. Some Instructors are very quick whereas others may respond within 48 hours (as stated above). 48 hours when the module is a week is challenging. The more the assignments and activities are organized the better the overall learning experience. One thing.. I really like the idea of incorporating Screenr to discuss the assignment verbally! Thanks Andrea–I’ll keep the screenrs coming. Andrea, what your post say’s to me is check and recheck. I believe it is not a bad idea to actually do the assignments, and test the discussion board. I think “stay up dated to emerging technologies” can be included in best practices. As it can help in getting more useful tools to enhance effectiveness and facilitation of online courses. What are some ways that Instructors can stay up to date on emerging technologies? Have you tried anything that has worked for you? Andrea, I know you aren’t asking me, but I listen to a podcast each week called TWiT. Or This Week in Tech. It is not at all specific to our field, but reveals to me new, cool technologies and I often find that I get cool ideas as I listen. It keeps me forward thinking and I never am content with what we have in existence now. Sorry for the delayed response. When I started teaching, I was a computer illeterate. I started attending IT related workshops (instead of courses) and learnt a lot in ashort period of time. I am always looking for good workshops at different places to get new ideas and hands on practice. I was in an earlier RU course where we tried to set up a synchronous learning activity with our small group–not only was the technology not capable, it was also terribly difficult to coordinate schedules. This was a couple of years ago, so perhaps things have improved on the technology front. The other option might be for an instructor to schedule one synchronous learning event–a webinar, perhaps–that allows all students to participate in “real time” and ask questions, etc. Most platforms allow for recording of the webinar for future on-demand viewing, for those unable to participate. Not sure if Blackboard accommodates this. Blackboard is now team with some management system to allow synchronous environment. I think this can really be a great tool to promote learner engagement and built build in interactivity. Many learners have issues with staying engaged in online learning formats unless interactivity and social learning aspects are addressed. Also, knowing who your audience is can really help with addressing individual differences in learning styles and addressing learner motivation tools. I have found being continuously engaged with the student at different levels really pays off in getting the complete focus of the student and concentration on the task at hand of the student. It might seem odd but I always found keeping them on their toes generates more positive energy from the students to help them in their learning.